Dr. William H. Peterson wrote the “Reading for Business” column in the Wall Street Journal for 14 years. He died last June at age 91. Let me first introduce the author of this essay. He is Dr. Edward W. Younkins, a C.P.A, a professor of accountancy, one who—in my judgement—is a most active friend of freedom and free enterprise, a gifted writer, a highly creative director of graduate business programs at Wheeling Jesuit University in West Virginia. Here then is a scholar who challenges growth-depressing, paternalistic welfare statism here in the U.S. and in virtually the rest of the developed world. Indeed, this book tops off a trilogy of books dedicated to Younkins’s proposition that a truly free market society is the way to go. Book one is Capitalism and Commerce: Conceptual Foundations of Free Enterprise (2002), an overview of how man survives and thrives. Topics include natural law, natural rights, individualism, freedom of association, private property, personal responsibility, morality, the nature and responsibilities of the modern corporation, and more. Book two in the Younkins trilogy is Champions of a Free Society: Ideas of Capitalism’s Philosophers and Economists (2008). Here, 20 giants like Aristotle and Adam Smith are selected and analyzed by Younkins as key thinkers who have contributed to today’s development of the classical liberal or libertarian worldview. 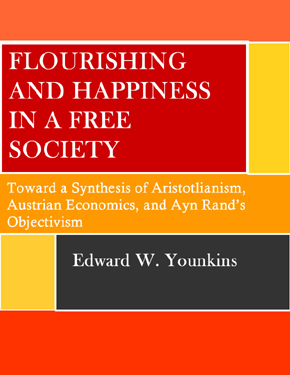 Now the climax of this trilogy comes around as Younkins explains here in book three what he sees as the basic compatibility of Aristotelianism, Austrian economics, and Ayn Rand’s Objectivism. He holds that this compatibility will help people better understand how a turbulent world with almost two hundred pulsating countries works at both getting along and, in a sense, not getting along, yet he shows you how you can still survive and flourish in it. Clearly, Younkins has been spending a large portion of his adult life fighting the persistent tendency of government everywhere to expand and smother personal philosophy and freedom, as statism has been broadly on the rise in the developed world, including in the U.S.
Younkins supplies charts to help readers grasp his remarkable synthesis, at a time of widespread mission uncertainty, and despite all the current election hoopla in America. Have you noticed how often the name of Aristotle pops up here and in serious literature? How come? Well, Younkins praises Aristotle (384-322 B.C.) as the most accomplished thinker who has ever lived, one who in effect helped forge the Renaissance and the spread of Western Civilization. Aristotle taught us, says Younkins, that every life and every career has a high potential purpose; so each of us should introspect, weigh possibilities, and seek out this grand goal of career and life optimization. Aristotle saw life as ongoing opportunities for achieving happiness, flourishing and self-determination via reason and faith, via reservations and even some suspicion in dealing with the State. "Younkins has been spending a large portion of his adult life fighting the persistent tendency of government everywhere to expand and smother personal philosophy and freedom, as statism has been broadly on the rise in the developed world, including in the U.S."
We need to return to the political and economic foundation upon which our nation was born. We must strengthen our commitment to individual freedom, free markets, and private property rather than to statist regulatory government. We must rid society of the statist notion that politics and the political process best address people's needs and problems. We must discredit the idea that the state exists to give citizens what they want. We must refute the statist claim that there is a right to education, health care, etc. The role of the state should be confined to protecting the freedom that allows individuals to pursue happiness or the good that each defines for himself. Step-by- step we must eliminate government agencies and cabinet departments except for Defense, Justice, State, and Treasury. What would remain would be the executive, legislative, and judicial branches but with greatly reduced powers. Today, our freedoms are invaded by external government controls. The less economic policy, the better. We must reduce as much as possible the weight of the state and increase the jurisdiction of the market. It is not regulation but individual action, private property rights, competition, and fluctuating prices that force adaptation to changing conditions and that promote efficient resource utilization. Still I wonder: Is not Younkins himself a devotee of career and life potentiality, if perhaps on a grander scale? I heartily agree with the supposition and submit his exquisite trilogy as evidence. Our author notes our heritage of individualism and freedom despite the enormous change that characterized the American way of life with the long woeful blot of slavery happily removed by passage of the Fourteenth Amendment to the U.S. Constitution in 1868. Meanwhile, Younkins views the Austrian School of Economics as going some ways to meeting the eternal challenge of statism over freedom. He covers thoroughly the work of Carl Menger (1840-1921), Ludwig von Mises (1881-1973), and Murray Rothbard (1926-1995), who wrapped up the Austrian message. Menger said economic action arises from the subjective values that individuals deem necessary to satisfy their needs. He advanced a means-ends rationality to explain economic cooperation in action, explaining such concepts as money, rent, profit, interest, division of labor, and so on. Younkins also applauds Menger for seeing early on how Aristotelian rationality spurred Austrian economists to undo the master trickery of the 1930s in the so-called “Keynesian Revolution” of Lord John Maynard Keynes (1883-1946). Keynes boldly pushed big government monetary and fiscal schemes to cut unemployment by “stimulating” Depression-hit business activity in the 1930s. Enter Ayn Rand (1905-1982) into this dynamic drama. She also avows her debt to Aristotle to reach and assess values and objectivity. A critical value is ethics. Rand says ethics is objective, personal, and moral. She justifies capitalism as a system based on moral justice. She advises: Restore such justice as required. Restoration is backed by her extraordinary novels, The Fountainhead and Atlas Shrugged, which show businessmen as potentially heroic characters, each novel portraying one or more businessmen who are persistent, original, independent thinkers who pursue controversial ideas to triumph. Her hit novels and their movie adaptations each show at least one thinking business entrepreneur as a case of individualism beating state collectivism, depicting business heroes as noble, appealing, and larger than life. Thus, Dear Reader, put on your thinking cap, invest time, and weigh options, so as to consider the Younkins message most personally. After all, you have a world to win. Dr. William H. Peterson wrote the “Reading for Business” column in the Wall Street Journal for 14 years. He was the 2005 recipient of the Schlarbaum Award for Lifetime Achievement in the Cause of Human Liberty given by Ludwig von Mises Institute of Auburn, Alabama. He died last June at age 91.